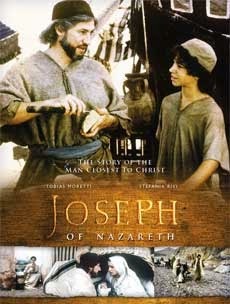 Joseph of Nazareth (2000) "Gli amici di Gesù - Giuseppe di Nazareth" (original title) TV Movie - 90 min - Drama - 29 April 2001 (USA) The people of Jerusalem are suffering under the reign of HEROD, and are hoping to be delivered from the Roman occupiers by the Messiah whose arrival, it is rumored, is to take place very soon. The 35-year-old widower is not interested in participating in any fighting against the Romans. Joseph gets a visit from JOACHIM and ANNA, asking him to marry their unprotected 14-year-old daughter MARY. Joseph agrees, but promises to preserve her chastity. Nevertheless, one day Mary tells him, in Anna's presence, that she is pregnant. Believing in this immaculate conception is very difficult for Joseph, as is the message that her son JESUS will end the reign of Herod, which is announced to him in a vision. Their son is born in a Bethlehem cattle shed and heralded as the new Messiah by the Three Magi. King Herod also finds out about the rumor, and decides to kill all of Bethlehem's firstborn. Joseph and Mary escape to Egypt.